The 1976 United States House of Representatives elections was an election for the United States House of Representatives in 1976 which coincided with Jimmy Carter's election as President. Carter's narrow victory over Gerald Ford had limited coattails, and his Democratic Party gained a net of only one seat from the Republican Party in the House. This election is notable for being the last time any party had a veto-proof majority in the House. Texas 22 Robert R. Casey Democratic 1958 Incumbent resigned January 22, 1976, to become commissioner to the United States Maritime Commission. New member elected April 3, 1976. Massachusetts 7 Torbert H. Macdonald Democratic 1954 Incumbent died May 21, 1976. New member elected November 2, 1976. Alabama 5 Robert E. Jones Jr. Democratic 1947 Incumbent retired. Arizona 3 Sam Steiger Republican 1966 Incumbent retired. New member elected. to run for U.S. Senator. 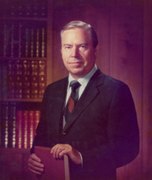 Arizona 4 John Bertrand Conlan Republican 1972 Incumbent retired. Arkansas 2 Wilbur Mills Democratic 1938 Incumbent retired. California 23 Thomas M. Rees Democratic 1965 Incumbent retired. California 27 Alphonzo E. Bell Jr. Republican 1960 Incumbent retired. Delaware at-large Pierre S. du Pont IV Republican 1970 Incumbent retired. Florida 8 James A. Haley Democratic 1952 Incumbent retired. Georgia 8 W. S. Stuckey Jr. Democratic 1966 Incumbent retired. Georgia 9 Phillip M. Landrum Democratic 1952 Incumbent retired. Georgia 10 Robert Grier Stephens Jr. Democratic 1960 Incumbent retired. Hawaii 1 Spark Matsunaga Democratic 1962 Incumbent retired. Hawaii 2 Patsy Mink Democratic 1964 Incumbent retired. Indiana 8 Philip H. Hayes Democratic 1974 Incumbent retired. Louisiana 1 F. Edward Hebert Democratic 1940 Incumbent retired. Maryland 3 Paul Sarbanes Democratic 1970 Incumbent retired. Maryland 8 Gilbert Gude Republican 1966 Incumbent retired. Michigan 2 Marvin L. Esch Republican 1966 Incumbent retired. Michigan 4 J. Edward Hutchinson Republican 1962 Incumbent retired. Michigan 7 Donald W. Riegle Jr. Democratic 1966 Incumbent retired. Michigan 12 James G. O'Hara Democratic 1958 Incumbent retired. Minnesota 4 Joseph Karth Democratic 1958 Incumbent retired. Missouri 2 James W. Symington Democratic 1968 Incumbent retired. Missouri 3 Leonor Sullivan Democratic 1952 Incumbent retired. Missouri 4 William J. Randall Democratic 1959 Incumbent retired. Missouri 6 Jerry Litton Democratic 1972 Incumbent died. Missouri 9 William L. Hungate Democratic 1964 Incumbent retired. Montana 2 John Melcher Democratic 1969 Incumbent retired. Nebraska 2 John Y. McCollister Republican 1970 Incumbent retired. New Jersey 14 Dominick V. Daniels Democratic 1958 Incumbent retired. New York 20 Bella Abzug Democratic 1970 Incumbent retired. New York 23 Peter A. Peyser Republican 1970 Incumbent retired. North Carolina 3 David N. Henderson Democratic 1960 Incumbent retired. North Carolina 11 Roy A. Taylor Democratic 1960 Incumbent retired. Ohio 13 Charles Adams Mosher Republican 1960 Incumbent retired. Ohio 18 Wayne L. Hays Democratic 1948 Incumbent resigned. Ohio 20 James V. Stanton Democratic 1970 Incumbent retired. Oklahoma 3 Carl Albert Democratic 1946 Incumbent retired. Oklahoma 5 John Jarman Republican 1950 Incumbent retired. Pennsylvania 1 William A. Barrett Democratic 1948 Incumbent died. Pennsylvania 3 William J. Green, III Democratic 1964 Incumbent retired. Pennsylvania 8 Edward G. Biester Jr. Republican 1966 Incumbent retired. Pennsylvania 16 Edwin D. Eshleman Republican 1966 Incumbent retired. Pennsylvania 17 Herman T. Schneebeli Republican 1960 Incumbent retired. Pennsylvania 18 H. John Heinz III Republican 1971 Incumbent retired. Pennsylvania 22 Thomas E. Morgan Democratic 1944 Incumbent retired. Tennessee 4 Joe L. Evins Democratic 1946 Incumbent retired. Texas 5 Alan Steelman Republican 1974 Incumbent retired. Virginia 1 Thomas N. Downing Democratic 1958 Incumbent retired. Washington 6 Floyd Verne Hicks Democratic 1964 Incumbent retired. West Virginia 4 Ken Hechler Democratic 1958 Incumbent retired. "Reagan Says G.O.P. Needs New Name and New Support." The Washington Post November 20, 1976, 13. "Reagan Suggests GOP should R.I.P." The Des Moines Register Friday, November 19, 1976, 16. ^ "Our Campaigns - TX District 22- Special Election Run-Off Race - Apr 03, 1976". www.ourcampaigns.com. ^ "Our Campaigns - MA District 07 - Special Election Race - Nov 02, 1976". www.ourcampaigns.com.